Pleo is a lovable one week old baby Camarasaurus, a gentle and loving plant eating dinosaur from the late Jurassic Period of out planet�s history. Ugobe used and researched actual Camarasaurus fossil records to help them model Pleo�s appearance and behavior. This dedicated attention to detail is what makes Pleo so realistic, that and inventor Caleb Chung�s genius at understanding the intricate details of animal body movement, even those who lived millions of years ago. But why a baby Camarasaurus? Well first of all, it�s cute enough to melt your heart and charm you with just one look. However, there�s a technical reason for the choice too. Although you will never think about it when you play with your baby Pleo, there�s a lot of powerful high tech electronics inside the cuddly critter. A baby Camarasaurus is a pudgy, chunky little thing which is not surprising since it grows up to be a 20 plus ton adult at some point. That cute, big, baby Camarasaurus head and chubby body leaves a lot of room for Ugobe to put the sensors, servos, and other good stuff that makes Pleo seem so life like. 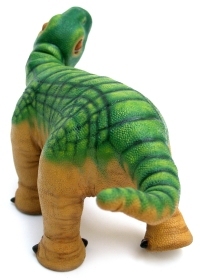 This is what made a baby Camarasaurus the perfect choice for Pleo. But you�ll just think it�s adorable! Check our page that tracks where to buy Pleo for the latest pricing and release date information.